Alec’s (Oliver Jackson-Cohen) life in England is falling apart. “The Healer,” his electrical repair store, is going out of business. He owes money to the wrong people, he's sleeping with married women, and he' s drinking like there's no tomorrow. Unexpectedly, a man named Raymond (Jonathan Pryce) shows up, claiming to be his uncle. Raymond has a proposition that provides Alec with a clean slate: he will pay all his debts in exchange for Alec moving to Nova Scotia for one year. Alec arrives to Lunenburg, the small rural town where Raymond owns a house. To make a living, Cecilia (Camilla Luddington), the local veterinarian he befriends, places an ad for him in the local weekly newspaper offering his services as an electrical repairman. 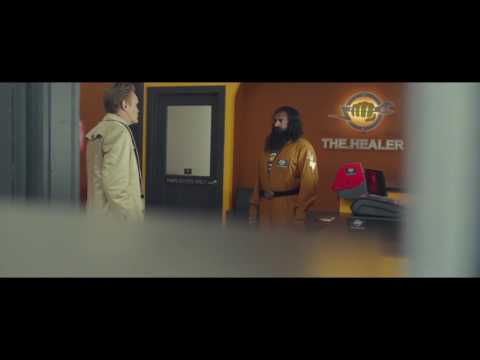 Trying to cleverly allure the townspeople, he decides to print, “The Healer, I fix anything electrical that is broken.” But the ad is misprinted; it seems that Alec is claiming to be an actual mystical healer of people. The townspeople flock to hire his services—but Alec rebuffs them, explaining the misprint. What's extraordinary and unexplainable is that those that do go and see Alec are cured of their ailments! The rumor spreads: Alec definitely heals. As much as Alec yearns to avoid being attributed any healing powers, more bizarre events keep occurring. Dogs seem absolutely fascinated with him; the local priest Father Malloy (Jorge Garcia), suffers a heart attack dies, and then comes back to life; and a deaf old man tells his wife to stop screaming at him. Alec, in shock, is discovering the family secret he possesses a gift… the gift of healing. Alec must now make a conscious choice: to accept or reject the gift.